Veteran strategy studio Petroglyph is making a Conan game. It is due for release in the first half of next year. The news comes in a quarterly report from Conan licence holder and videogame publisher Funcom. Funcom is fully funding the project and targeting a PC launch during the first half of 2019. They explicitly acknowledge “Petroglyph is a well-known developer of real-time strategy games”, and state the studio is “utilising the Conan the Barbarian IP”. For more commanding and conquering, check out the best strategy games on PC. There’s not much more detail in the report, other than some corporate-speak about the collaboration being “in accordance with [Funcom’s] strategy of publishing both internally and externally developed titles in order to generate more revenue streams” and blah blah blah. You can check out the report for yourself here. 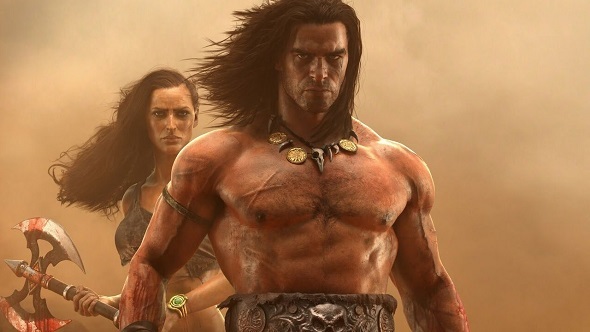 Further updates are promised for Conan Exiles, including paid DLC, the first of which will be released in June. “New features and functionality”, bug fixes, and quality of life updates will all be free. Conan Exiles has apparently been profitable since its first week in Early Access, from January 31 last year. Enticingly, there are two more internal projects in early concept stages. Yet another Conan game is spinning up at Funcom Oslo, while Funcom North Carolina is hiring for “a cooperative online shooter” with “using an IP from Heroic Signatures that isn’t Conan.” Funcom co-founded Heroic Signatures to manage the IP of Conan author Robert E. Howard, which includes Solomon Kane, Wolfshead, Kull of Atlantis, and many more.